My dad, Mark Davidson, says that financing a small business with credit cards is like juggling flaming chainsaws. It’s more than a little uncomfortable, he says, and you don’t want to be doing it for long. Still, he did it — and for him, it worked. When he opened a photo lab in 1994 in Palm Springs, California, he paid for about half of his expenses with plastic. But he stuck to his business plan and kept costs down, and in a few years, he was able to pay off his credit card debt. Fast forward 20+ years. If you’re starting a small business today, you have a lot more choices. You can browse through hundreds of loans online within minutes. With crowdfunding, you can avoid going into debt altogether. When he was a junior in college, Grayson Bell, who blogs about personal finance at Debt RoundUp, started a consumer electronics e-commerce business in Boone, North Carolina. When he covered the expenses of his company, called Overdrive Electronics, LLC, with credit cards, he says he didn’t have a business plan. “I was kind of throwing money against the wall and seeing what would stick,” says Bell, who closed the consumer electronics company in 2009, after four years of operation. The electronics market was competitive, and his margins were razor-thin, and credit cards made it easy to over-borrow. He was only making the minimum payments on his accounts, waiting for the revenue to kick in. Over a few years, his credit card debt grew to $50,000. Bell has since paid off the credit card debt and started a new venture, a WordPress blog management service, iMark Interactive, LLC. But he learned a lot from his college business, he says — namely, that it’s important to have a business plan from the start. “If you have no idea where you’re going, you’re never going to get there,” he says. For more guidance on how to write a business plan, check out this guide. Thirteen years ago, when Johnette van Eeden founded Star Wellness, a health care screening company in Euless, Texas, she was the only employee. She financed her medical equipment purchases with a 0% APR credit card, and paid off the whole balance within the 12-month interest-free promotional period. Since then, she’s expanded her business to three locations. Part of the reason her preventive health care company succeeded, van Eeden believes, is that she didn’t have the “build it, and they will come” mentality. “It was more like, ‘They’ll come, and then we’ll meet the need,'” she says. By opening more locations as demand for her company’s services grew, she was able to expand her franchise in a way that made business sense. Now, she puts all the company’s expenses on credit cards, which she pays in full every month, to maximize her rewards earnings. To date, she’s redeemed over 2 million points with Chase, she says. Space. If you do most of your work online or on-location, think about spending less when looking for an office to rent. Merchandise. Consider stocking merchandise more conservatively at first, so you can tell what’s selling and what isn’t before making a bigger investment. Website. Instead of hiring a design firm from the get-go, try making your own website with a free or low-cost platform like WordPress or SquareSpace. As your revenue increases, you’ll be in a better position to invest more in all three of these areas. 3. Scope out more options. P2P personal loans for small business. If you have excellent credit, and your small business is brand-new, a personal loan from peer-to-peer lenders like Prosper or LendingClub can help finance your venture at a low cost. The caveat, though, is that you — not your company — are liable for the debt. To qualify for a P2P business loan, you generally have to be in business for a longer time. Crowdfunding. Some crowdfunding sites, like Indiegogo and Kickstarter, let you accept donations from investors in exchange for small gifts, such as sample products. This way, you can get financing without giving away equity or getting into debt. If you don’t hit your funding goal, though, you generally forfeit your earnings. Others, like EquityNet and AngelList, allow you to hand over ownership (equity) of part of your startup for funding. This could complicate matters when your business is much larger, though. Grants and contests. If you’re confident about delivering your elevator pitch in front of judges, entering into a business pitch competition could help you win startup capital for your new venture. Applying for a federal grant in your city or industry could give you a leg up, too, if your business fits certain criteria. Before applying for any kind of funding, make sure you understand the terms of the agreement. To be sure, all of these methods of funding come with their own risks and costs. For personalized guidance, visit your local Small Business Development Center or Score organization, or submit a question through NerdWallet’s free Ask an Advisor platform. If plastic is still the most affordable option, look for 0% APR small business credit card offers, like van Eeden did, so you have a longer time to pay off your balance without shelling out cash on interest. Successfully financing a small business with credit cards is possible – just ask the founders of Google. But even when you do everything by the books, there are no guarantees. My dad ran a profitable photo lab for 15 years. 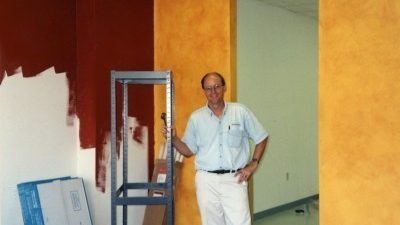 But shortly after the economic downturn of 2008, like Bell (and 170,000-some other small business owners), he had to close his company. Since then, he’s started a successful small photography business. I asked my dad if he’d finance a small business with credit cards again, if he could do it all over. He said he might — if, after looking at alternatives, he decided it was the best choice. But it’s not something he would want to do for long. 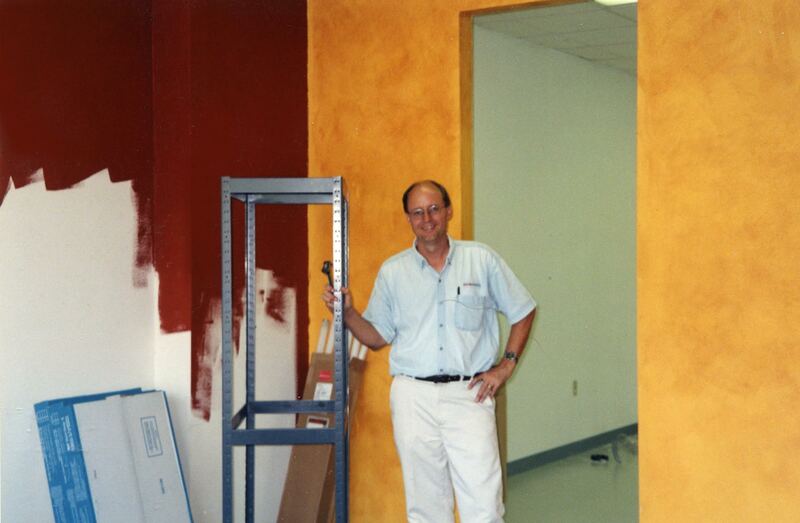 First photo of author’s dad, Mark Davidson, in 1994, shortly before he opened his photo lab. 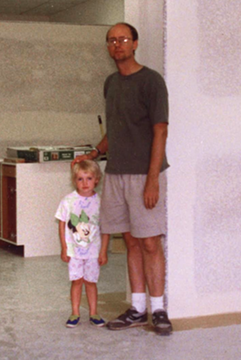 Second photo of author with her dad in photo lab. Both photos are courtesy of Mark Davidson.